This week I learned 9:00 is not early enough to get anything other than beets and greens. No one in my family likes beets or greens. Devise Plan B for week one. End up at Target buying what organic produce I can find while I’m buying pull ups. My raspberries are moldy when I pull them out of the fridge Monday morning. 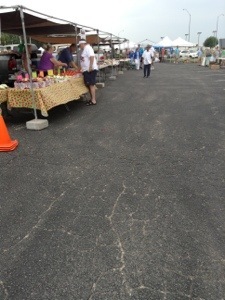 I got up early on Saturday morning and headed back to the local farmer’s market. 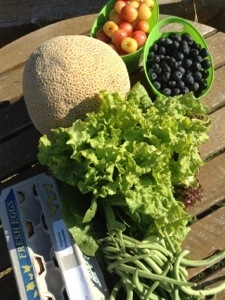 For $21, I picked up: blueberries, green beans, lettuce, cherries, a cantaloupe, and fresh eggs. I also went to Sprouts for $60 more in produce and meat: Trout fillets, tri-tip beef, free range chicken tenders, pork sirloin roast, organic yogurt, 1/2 # walnuts, 2 heads of garlic, 2# carrots, 1 bunch celery, 4 bell peppers, 2# lemons, 2# of peaches, 2 sweet potatoes, 2# sweet onions, 12 oz raspberries, 3 HASS avocados, 1/2 # vine tomatoes, and 1# black plums. I learned Sprouts gives bring your own bag credit, the infant carrier takes up a whole cart, and Wednesdays they honor this week and last week’s ads. They helped me to my car. 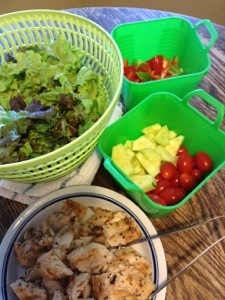 All of the veggies were gone by Wednesday. It turns out we are a two dozen egg household now. It was all gone by Friday night. Pa pa let me raid his garden when we went to visit. 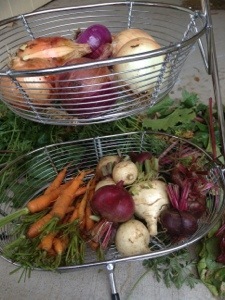 We cleared out the last batch of root veggies. I even tried some of his beets 🙂 maybe Baby Girl will like them?